"The latest in a long line of Kenyan benga greats such as D.O. Misiani and Colella Mazee, Opiyo Bilongo started his musical career in the 1990’s. After playing with several different Luo dance bands throughout western Kenya, he hooked up with benga legend Osito Kale, as a rhythm guitarist. A couple years of constant touring later, and Mr. Bilongo was ready to break out on his own. He recorded Nyako We Sanda, whose title track became a hit, and has never looked back. 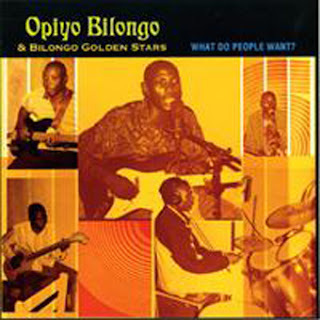 Suddenly popular, Mr. Bilongo needed a band and, so, Bilongo Golden Stars was born. By 2004, Bilongo and his new group were becoming quite deadly on the benga scene. They got together with Extra Golden guitarist Ian Eagleson in Siaya and recorded not one, but two follow-ups to Nyako We Sanda. What Do People Want? brings together the best tracks from both of those releases." More details and sound samples here. Thanks to Dom at Sterns for the heads-up. And thanks to Cheeku you ought to head straight to the "with comb and razor" blog and pick up the brilliant Flashback compilation of Nigerian Afro-rock fusion from 1970-80. All credit should go to AFKAP of darkness and his site, fascinating reading about making a movie in nigeria as well. Some neighbors of mine are nigerian. when they came here, they left most of their music behind. I've given them a number of classic nigerian recordings - things like osadebe, uwaifo, ikenga, fela etc. The thing that made them the happiest, that inspired sweet nostalgia was the flashback comp. Wow, thanks for this. I've been looking for the EMI Super hits comps for ages.